LeftCoast is six years into an ACE-funded Creative People and Places Programme and we are about to roll out year one of our Big Lottery Funded Reaching Communities Programme. 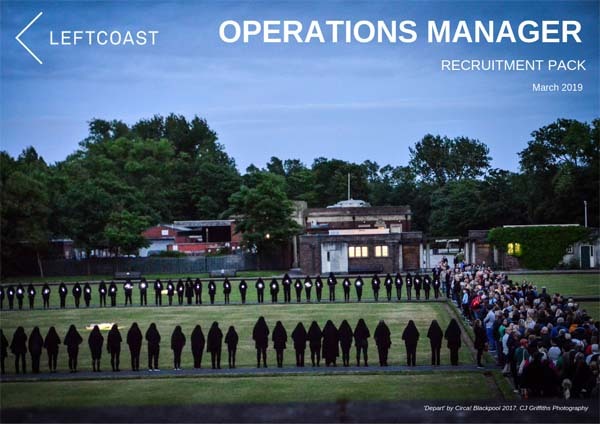 With a budget of just over £1m for the next four years, we are looking for a smart and experienced Operations Manager to ensure our day to day business responsibilities (and grant funding conditions) are executed effectively. is at a genuinely interesting stage of its development as a progressive arts organisation with a growing reputation for its socially-engaged practice. In sector-speak : LeftCoast works with local people to generate high-quality artistic outputs that serve well-being and social impact outcomes. We work with residents across the Fylde Coast alongside experienced artists, producers and partners to create alternative perceptions of Blackpool and Wyre and help to tell the stories of the people that live here. You are a highly-organised, strategic thinker who has a fondness for systems and attention to detail. We need your sharp management skills and your facilitative management style. This role requires a straight head in an organisation that has a track record of taking risks and doing things somewhat differently. We are a high trust/high challenge team, we care about our work and your fit will be important to us. If you are interested in applying download the Recruitment Pack and Application Form below.